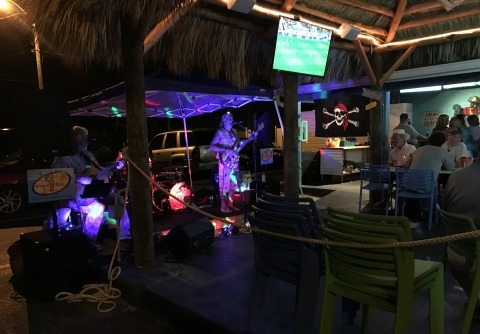 Fins Seafood & Dive Bar has brightened up Del Prado Blvd with good food and beverages, a fun beachy atmosphere, and live music! 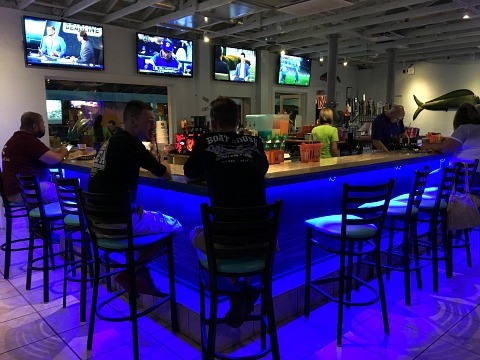 I love the new color of the restaurant, an aqua bluegreen that highlights the casual and laid-back feeling of the place with its theme of scuba diving, fish, and surf and sand. They are located where Carmine Street New York Pizza and Mussels used to be and totally overhauled the previously outdated space with a fresh new look. 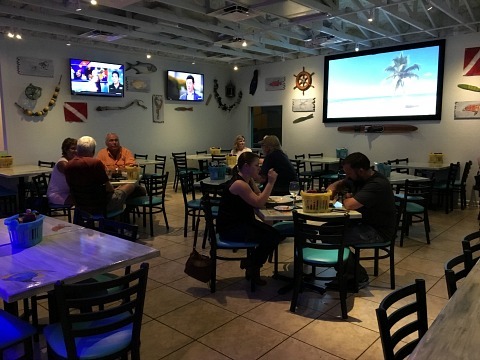 The inside features a dining in one room and a bar area in a second room, walls are decorated with all kinds of interesting fish art. 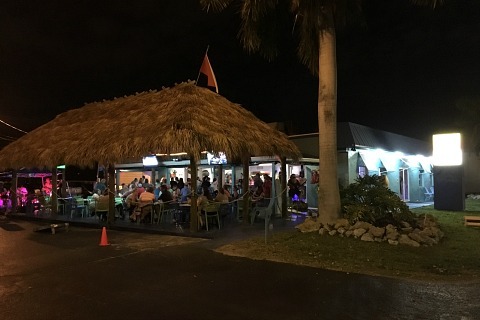 Or, you can dine outside under the tiki hut at either the bar or at tables where you can listen to live music on Wednesday nights. 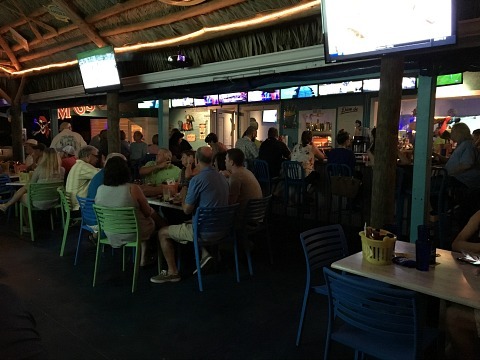 Big-screen TV's are set up inside and out for those of you wanting to watch sports. I had a hard time deciding what to eat ....... I hadn't had lobster in awhile and there were several options on the menu. I finally decided on the Lobster BLT with yummy Pineapple Coleslaw. It was loaded with fried lobster, bacon, tomatoes and lettuce, served in a wrap and topped with remoulade sauce .......... it was a little bit spicy but pretty darn good! 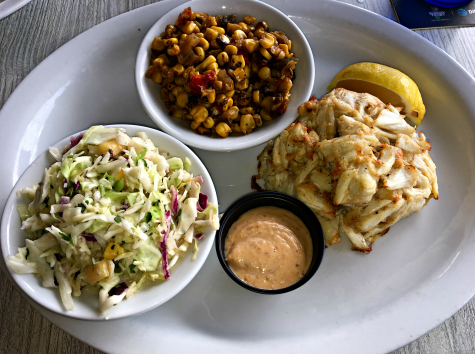 I was able to sample some very tasty grouper from their Diver Down Seafood Basket. I kept hearing how wonderful their Crab Cakes are and went back to try them. The owners are from Maryland, a state known for their crab cakes, and these are the best I've ever had! 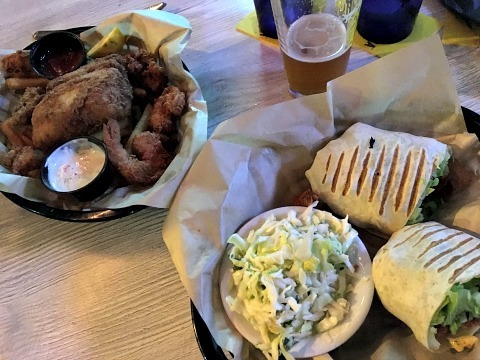 Also on the menu are a large selection of appetizers, salads, sandwiches, soups, po boys and burgers, ribs, pasta, steak, and seafood baskets and entrees. 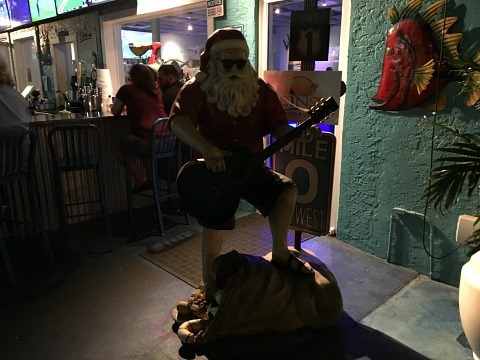 We thoroughly enjoyed the fun vibe along with our dinner, attentive service, and live music by local band High Tide. Happy Hour starts at 3PM during the week, call them for take-out or to make a reservation. Check out their brunch specials on Sundays including a new raw bar, as well as holiday events. They are open Sunday - Thursday from 10AM-10PM, Friday and Saturday from 10AM-12AM. 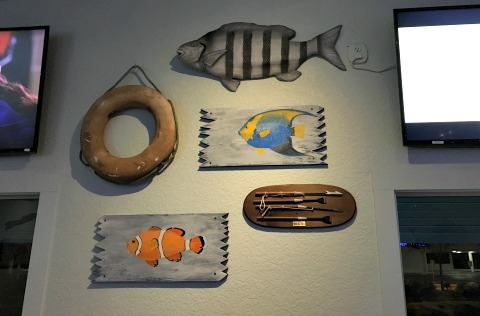 Make sure you check out the Palm Frond Fish painted by Dale Werner, a local artist and musician, that decorate the restaurant!